Before the Syracuse Chiefs took on the Louisville Bats in the first game of a four-game series on Thursday night, some familiar faces took the field: Boeheim’s Army. As the team gears up to take on either the South Jamaica Kings or the Philadelphia Stars in this weekend’s round of The Basketball Tournament, they stopped by NBT Stadium to throw first pitches and sign autographs for Orange fans. 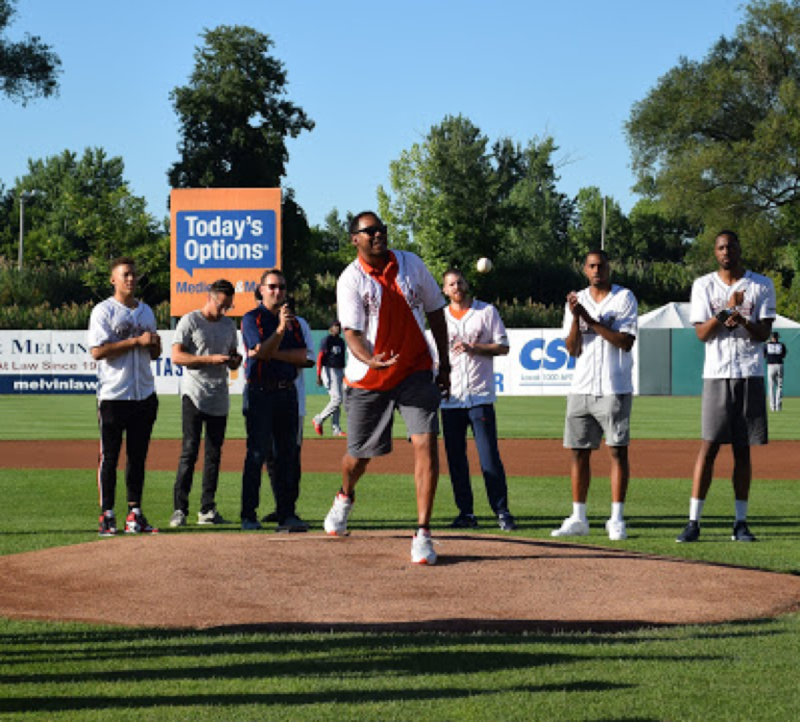 While the basketball squad stood at the pitcher’s mound donning their honorary Syracuse Chiefs jerseys, one man stood out among the rest: Ryan Blackwell. Blackwell, the last to throw out a pitch, stood with his jersey unbuttoned and open, revealing the orange polo hidden underneath — a symbol of his Syracuse pride. While he’s played professional basketball internationally— France, Portugal, England and Japan — he’s back in Syracuse as both the Boeheim’s Army coach and the Liverpool High boys basketball coach. After transferring to Syracuse from the University of Illinois, Blackwell was a starting forward for three seasons. Playing nearly 3,500 minutes in his Syracuse career, Blackwell started in all 100 games he played in. He led in rebounds both his sophomore and junior years. Blackwell, the head coach at Liverpool since 2015, said this past season was a “complete turnaround” from the 2016-17 season. In April, he was named the USA Today New York State Basketball Coach of the Year for his work at Liverpool High. A coach of about 16 kids, Blackwell said winning the first state title in the school’s history was huge. Blackwell said he had the Army come in and help the boys practice. In 2017, Blackwell was named head coach of Boeheim’s Army and led the team to become the Northeast Regional Champions the same year. Blackwell feels confident about the tournament this weekend. Center for the Army Dashonte Riley said Blackwell is a player’s coach. Shooting guard Brandon Triche ’13 also emphasized Blackwell being a player’s coach. Boeheim’s Army will play in Brooklyn on Saturday against the winner of the South Jamaica Kings and Philadelphia Stars game. The game will be broadcast on ESPN3.